When cold weather comes knocking on your door, treating yourself to a warm, hearty dish can help remove the damper of chilly temperatures. So, to help you handle the Severna Park winter, stop by Adam’s Taphouse and Grille. Whether you’re hungry for a classic winter meal or something new, we offer shelter from the cold and an exciting selection of homestyle winter dishes. 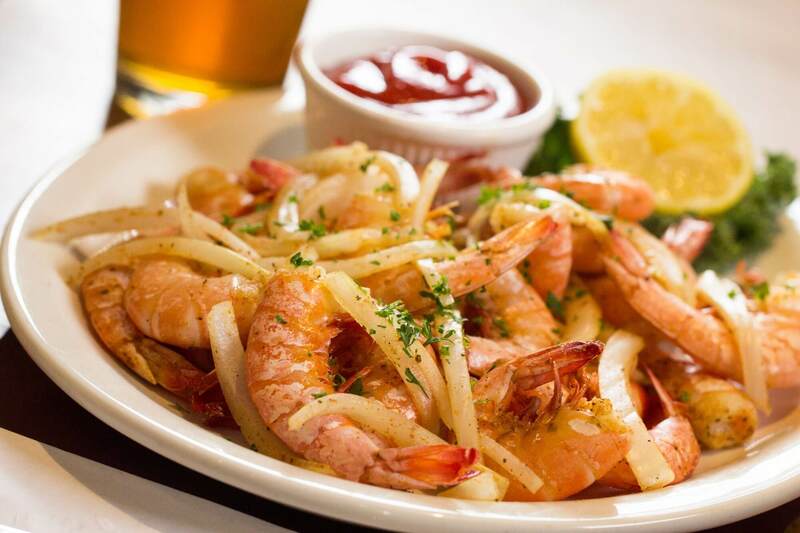 Start your meal off with a few of our enticing appetizers, like a half pound of our spiced steamed shrimp. Or, deep-fried and served with silky cinnamon butter, our hush puppies bring Southern comfort and warmth to chilly Maryland. Fresh mozzarella, breaded and served with marinara sauce, will remind you of robust holiday family meals. And if you try our chili con queso, which blends delicious chili with creamy nacho cheese, you’ll be warmed up in no time and ready for the main dish. When the cold weather is getting to you, a good cup of soup is never a bad choice. Adam’s uses only the best ingredients, and we make our soups on site. Try a bold new flavor with our soup of the day, or stick to a classic bowl of homemade chili. Nothing fills your stomach like a delicious barbecue dinner. Whether you’re craving a platter of barbecued ribs, chicken or shrimp, our kitchen serves it all. Besides BBQ, we dish up steak and seafood to warm you up on the coldest nights. Enjoy our thick strip steak, juicy tenderloin, fresh salmon, grilled ahi tuna and more when you visit. Then, top off your winter dish with a couple of hot sides, like baked potatoes, BBQ’d baked beans, mashed potatoes with gravy or sweet potato fries. Can’t choose what you’d like for the main course? Narrow your choices down to one of our Fab 5 specialties. Served for lunch, our Boom Boom Shrimp boasts a piquant sriracha sauce for a heat that will help you forget the weather outside. Or, warm up with the seasoned flavor of dry-rubbed and smoked steak when you choose the Smoked Steak Tacos. For dinner, enjoy a hearty serving of mashed potatoes and a vegetable with Smokehouse Chicken Thighs or the Bourbon Glazed Pork Medallions. Finally, we also feature daily specials for lunch and dinner. And, don’t forget to top off your meal with one of our eighteen craft beers on tap. Since we change our offerings throughout the year, there’s sure to be a seasonal brew suited for the winter months. From office parties to anniversaries, catering from Adam’s will make your event one to remember. We’ll brave the winter weather to bring you delicious winter dishes like steamed shrimp, whole chickens, hearty baked beans, surf and turf, pig roasts or our famous ribs. Plus, our entire menu is customizable, meaning we’ll be happy to serve you the right type and quantity of food. Looking for a family-friendly bar and restaurant in the Severna Park, MD area? Contact Adam’s Taphouse and Grille today at 410-647-5757 to learn more about our winter dishes. Or, join our email club for the latest updates on new menu items, events and all things Adam’s. Our lunches, dinners, and specials are sure to keep you warm and cozy during the coldest months.